Dr. Khalil Semaan, OD understands the importance of vision–and visionary care. As a licensed optometrist, Dr. Semaan has dedicated his career to providing the best vision care to a wide range of patients. His experience working with individuals from a variety of backgrounds–including the residents of Huntington Beach and Orange County; military veterans in Tucson, Arizona; and underprivileged families in Los Angeles–has shaped his approach and practice. When it comes to clinical care, Dr. Semaan excels at both the design of individual treatment plans and the oversight of large-scale initiatives. As a member of the Beach Eye Medical Group in Huntington Beach, Dr. Semaan provides expertise in the diagnosis and treatment ocular disease. As a healthcare professional working on the community level, Dr. Semaan has played a vital role in leading a comprehensive vision care program for a large managed care population in Coachella Valley, California. Fluent in Arabic and able to speak optometric Spanish, Dr. Semaan is accustomed to serving the diverse population of Southern California. 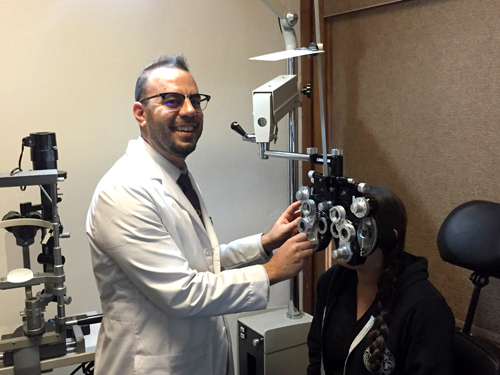 A California board-certified optometrist and general eye care specialist, Dr. Semaan earned his Doctor of Optometry degree from the Southern California College of Optometry (SCCO) in Fullerton, CA. Prior to his training in optometry, he received his undergraduate degree in Biological Sciences with a minor in Chemistry from California State University at Long Beach. Dr. Semaan also holds a glaucoma certification, a special qualification given by the state of California. In addition to his professional experience as an optometrist, Dr. Semaan has worked as an eye care fashion and design consultant. His passion for travel has led him to exciting destinations both abroad and at home in the United States and has deepened his appreciation for new sights, cuisines and cultures. He counts golf and basketball among his favorite pastimes.